In this report titled ‘Flat Glass Market: Global Industry Analysis (2012-2016) & Forecast (2017–2025),’ Persistence Market Research covers different aspects of the global flat glass market and presents useful insights for investors and other key stakeholders planning to enter this lucrative market. The report has been structured in a cohesive manner, presenting the data and factual information in a seamless flow to enable the reader to acquire the relevant insights easily. Before describing the global flat glass market in terms of key definitions and the market taxonomy, the report aims to provide the reader with a 360o view of the global market by means of a succinct yet comprehensive executive summary. This section presents the global market overview, an analysis of the global flat glass market, key market dynamics, and our recommendations to enable the reader to view a quick snapshot of the global flat glass market. The next section of the report presents the value and volume forecast of the global flat glass market – this includes market volume projections, market size and Y-o-Y growth, and absolute $ opportunity. This is followed by the global flat glass market value chain, operation cost structure, and pricing analysis. Detailed information on the macro-economic factors, forecast factors, and a global market analysis concludes this section. The next few sections focus on the value and volume projections of the global flat glass market for the different market segments and across the key assessed regions and countries. These forecasts include a historical market analysis for the period 2012 – 2016 followed by the current market size and forecast for the assessment period 2017 – 2025. These sections end with an impact analysis of market drivers and restraints followed by an in-depth market attractiveness analysis. The report then dives into the regional market forecasts, taking the reader one level deeper into the assessment of the global flat glass market by presenting regional data and insights. 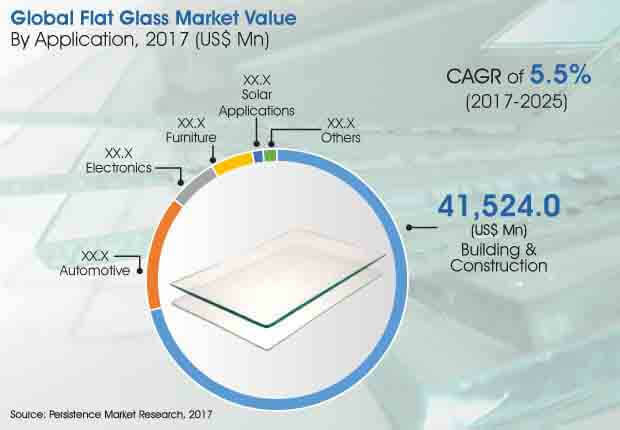 One of the most important sections of the report is the competitive landscape – a detailed assessment of the current vendor ecosystem of the global flat glass market. This section highlights the market presence (intensity map) of key players, a competition intensity mapping by market taxonomy, and an insightful competition dashboard. The leading companies operating in the global flat glass market are also profiled in this section, where we focus on important details such as the company overview, key financials, business and go-to-market strategies, and recent market developments. This section has one key objective – to present the reader with a high-level overview of the current market vendor landscape along with company specific information to provide useful insights on the current level of competition that exists in the global flat glass market. At Persistence Market Research, we follow a systematic research approach to track the various market parameters. In-depth secondary research is used to arrive at the overall market size, top industry players, top products, industry associations, etc. Data and information gathered through secondary research is validated by conducting interviews with industry experts, industry players, distributors, and other key market stakeholders. This data is validated using the triangulation method, in which secondary and primary data along with our analysis contributes to the final data, which is then scrutinized using advanced tools to glean pertinent qualitative and quantitative insights into the global flat glass market. The global flat glass market has been segmented on the basis of type, manufacturing process, application, and region to enable accurate tracking of market estimations. The growth of the global flat glass market is anticipated to witness a boom in the coming years owing to a burgeoning construction and automotive industry worldwide. Also, increase in government investments in renewable energy sources will also trigger global market demand for flat glass in solar applications. A significant increase in the construction sector in Latin America is also expected to boost market revenue growth in the near future. There is a growing shift in focus towards the construction of energy efficient buildings and renovation of existing infrastructure. Countries are also moving towards renewable solar energy for use in multiple applications. All these factors are expected to positively impact demand and revenue growth of the global flat glass market in the next few years. As the construction and automotive industries are the major end users of flat glass, manufacturers of flat glass can benefit from lucrative growth opportunities across these two industry sectors, especially from the growing automotive industry in several Asian countries. Of the various applications of flat glass, the Building & Construction sector is anticipated to lead the global flat glass market in terms of revenue share, estimated to hold more than 70% value share in the global flat glass market throughout the forecast period. This segment is projected to dominate the market by the end of 2017 and will likely remain steady in terms of market growth. The Building & Construction segment is projected to create a total incremental $ opportunity of about US$ 22 Bn between 2017 and 2025 while the Automotive segment is estimated to create a total incremental $ opportunity of US$ 4,752.2 Mn between 2017 and 2025. The Automotive sector however, is expected to witness good progress in the coming years. This segment is anticipated to hold about 14% value share of the global flat glass market throughout the forecast period. In the automotive industry, flat glass is typically sold through the aftermarket and by OEMs. The automotive industry in Asia Pacific is likely to witness a significant demand for flat glass, owing to the rapid growth of the sector across the region. A rapid increase in the production of automobiles in the world is the key reason for the utilization of flat glass. Aftermarket replacement glass for automotive is also expected to contribute to the growth of the global flat glass market in the coming years. Flat glass is expected to be in high demand in solar panels, given a conscious shift towards renewable sources of energy for the generation of electric power that has led to a surge in the manufacture of solar panels. The increased interest in creating a sustainable future has aided well in the demand for such panels that predominantly use flat glass as a protective shield, thereby biding well for the growth of the float glass market in the near future. The furniture industry is anticipated to witness ups and downs owing to a highly fragmented value chain. The wood or lumber industry is also likely to impact the flat glass market as furnishings and other products use flat glass for several applications. The electronics industry is on a steady growth at a global level and will continue to be so especially in the Asia Pacific region, thereby having a high impact on the global flat glass market in the foreseeable future. Phoenicia Flat Glass Industries Ltd.
Emerge Glass India Pvt. Ltd.